Yesterday a well organized disturbance southwest of Cabo San Lucas. looked as though it had achieved depression status. 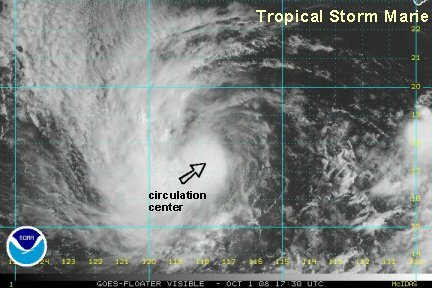 The tropical disturbance continued to develop rapidly and now is the thirteenth tropical storm of the eastern Pacific hurricane season. 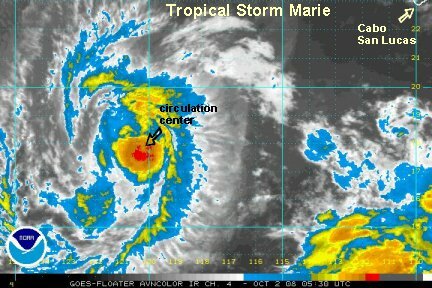 As of 11:30 am pdt Marie was centered about 610 miles southwest of Cabo. 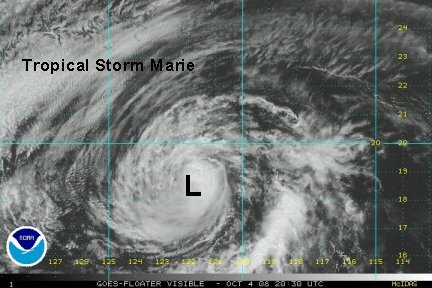 Marie currently has good outflow aloft on the western side of the circulation. The eastern side the circulation is being exposed by shear. A mid-level high pressure center to the northwest is causing this. 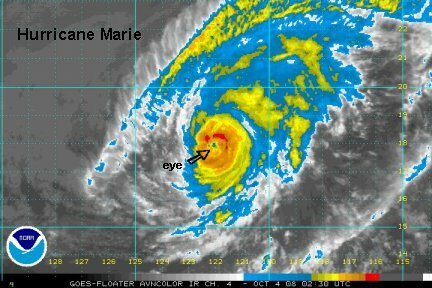 Marie has top sustained winds of 50 mph which looks reasonable to us. It is moving away from Mexico, and the only noticeable effect would be a slight increase in the swell on the Baja. Marie is centered near 18.0 N / 120.3 W or about 745 miles wsw of Cabo San Lucas. Officially Marie is at 50 mph. The latest microwave estimate as about 40 mph, way down from estimates of about 60 mph from Wednesday afternoon. The convection has built up over the past few hours so, we think 45 mph is a good compromise of top sustained surface winds. It appears that a strengthening phase is beginning. Outflow aloft also has improved since Wednesday afternoon. Expect tropical storm Marie to continue wnw away from Mexico. No appreciable effects, except for possibly a small increase in swell on the Baja. Tropical storm Marie is centered near 17.6 N / 120.8 W or about 785 miles wsw of Cabo San Lucas. 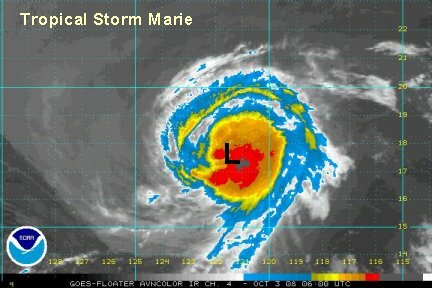 Officially Marie is at 45 mph and weaker than the previous advisory. The latest microwave estimates are near 55 mph and deep convection is spreading. On a rare turn of events we think that tropical storm Marie is stronger - 50-55 mph. Marie has been moving slightly south of west recently and should basically remain on a mostly westward track. this track will take Marie over somewhat cooler water and start to weaken it. Expect tropical storm Marie to continue west away from Mexico. No appreciable effects, except for possibly a small increase in swell on the Baja. Tropical storm Marie is centered near 17.6 N / 121.6 W or about 835 miles wsw of Cabo San Lucas. Officially Marie is at 50 mph. The National Hurricane Center raised up the wind speed on the previous advisory. We still think that Marie is a bit stronger at 55 mph. The latest microwave estimate was closer to 60 mph. Deep convection continues to build on the southeastern quadrant of the circulation. Tropical storm Marie is moving slower, probably about 5 or 6 mph to the west. With this weak motion, the recent strengthening phase may continue for awhile longer, until it moves over slightly cooler water. This will cause weakening. Expect tropical storm Marie to continue west away from Mexico. Tropical storm Marie is centered near 17.6 N / 122.0 W or about 855 miles wsw of Cabo San Lucas. 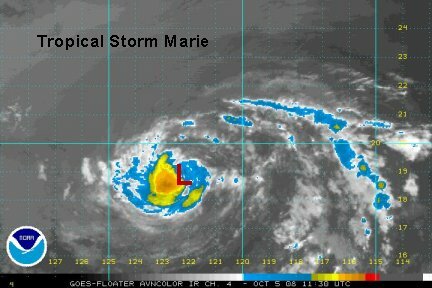 Officially Marie has stengthened to 70 mph as of the 8 am pdt advisory. The last microwave estimates as of this morning were almost 70 mph. It appears to us that the cloud tops are now warming, especially on the western side. With this being said, we think tropical storm Marie peaked this morning and is on a weakening phase. Our estimate is that winds are about 60 mph. Marie should continue to weaken as it is approaching cooler ocean water. The National Hurricane Center upgraded Marie to a 75 mph hurricane. Over the past two or three hours a small pocket of dry air has wrapped into the circulation. We're actually not sure if it is a bona fide eye or a "sucker hole" in which dry air gets wrapped into the circulation and looks like an eye. The reason for the skepticism is that the cloud tops really aren't that cold and the latest microwave estimate was only 55 knots or 63 mph. 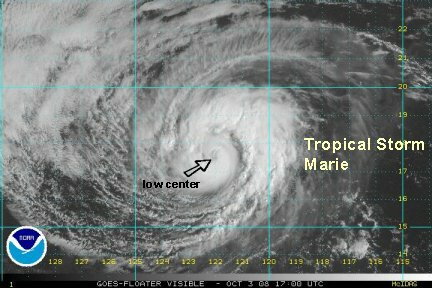 It is possible that Marie is actually a hurricane, since very small tropical cyclones like this one can spin down or up very quickly. We'll know for sure soon. Marie still poses no threat to land. Hurricane Marie is centered near 18 N / 122 W or about 845 miles wsw of Cabo San Lucas. 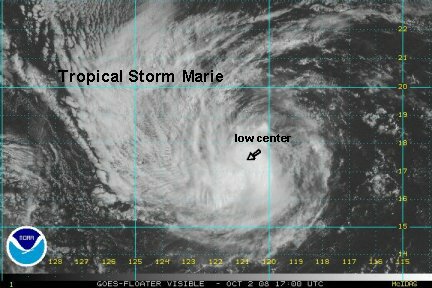 Marie's central dense overcast is tiny - only about 125 miles in diameter. We've been studying the satellite imagery and we still believe that there was a bit of dry air that was ingested into the circulation and resembled an eye. We now believe that a true eye has formed and the eyewall cloud tops are cooling. Over the past several hours microwave estimates are now in the 60-80 mph range, a general increase compared to earlier. Hurricane Marie has changed direction recently and has actually drifted north. Marie still poses no threat to land. The National Hurricane Center had increased Hurricane Marie up to 80 mph on their last update at 2 am pdt. They did this on a slightly higher microwave estimate. More recently, I.R. satellite imagery shows that the eye has collapsed and the satellite presentation is much less organized. Our estimate is that Marie is at 60 mph and is a tropical storm now. Marie has shifted south somewhat and looks like to have made a small loop after drifting north overnight. 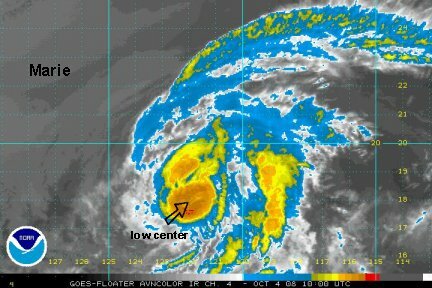 It is centered near 121.8 N / 17.9 N. Marie remains no threat to land. Marie is nearly stationary near 18.5 N / 122.2 W or about 850 miles wsw of Cabo San Lucas. The National Hurricane Center has brough the winds down now to 65 mph. We think that the mcirowave estimate of 49 knots is better. We'll go with 55 mph sustained surface winds. The deep convection is fading near the core, supporting the lower wind speed. The cloud structure is also looking more stratiform a sign of less instability usually found over cooler water. Tropical storm Marie is centered 830 miles wsw of Cabo San Lucas and officially has top sustained winds of 45 mph. We finally agree with the National Hurricane Center! Only a little convection remains on the southwest quadrant of the circulation. 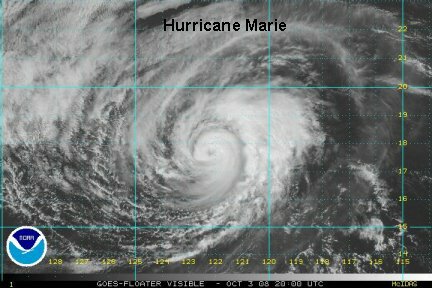 Marie is over slightly cooler water and is slowly coming to its demise. This will be our last update on Marie.